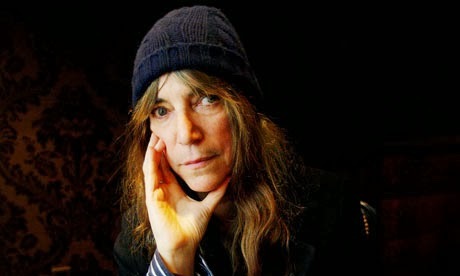 In the video above, poet, artist, National Book Award winner, and “godmother of punk” Patti Smith reads a selection from Virginia Woolf’s 1931 experimental novel The Waves, accompanied on piano and guitar by her daughter Jesse and son Jackson. The “reading” marked the opening of “Land 250,” a 2008 exhibition of Smith’s photography and artwork from 1965 to 2007, at the Fondation Cartier pour l’art contemporain in Paris. Smith’s choice of a title for the evening is significant. She titled her 1979 album Wave, her last record before she went into semi-retirement in the 80s. And her exhibition includes a set of beautiful photographs taken at Woolf’s Sussex retreat, Monk’s House. Her performance seems like an unusual confluence of voices, but Woolf might have enjoyed it, since so much of her work explored the uniting of separate minds, over the barriers of space and time. While Smith expresses her indebtedness to Woolf, one wonders what the upper-class Bloomsbury daughter of a well-connected and artistic family would have thought of the working-class punk-poet from the Lower East Side by way of Chicago? It’s impossible to say, of course, but somehow it’s fitting that they meet through Woolf’s The Waves. The six characters were supposed to be one. I’m getting old myself now—I shall be fifty next year; and I come to feel more and more how difficult it is to collect oneself into one Virginia; even though the special Virginia in whose body I live for the moment is violently susceptible to all sorts of separate feelings. Therefore I wanted to give the sense of continuity.